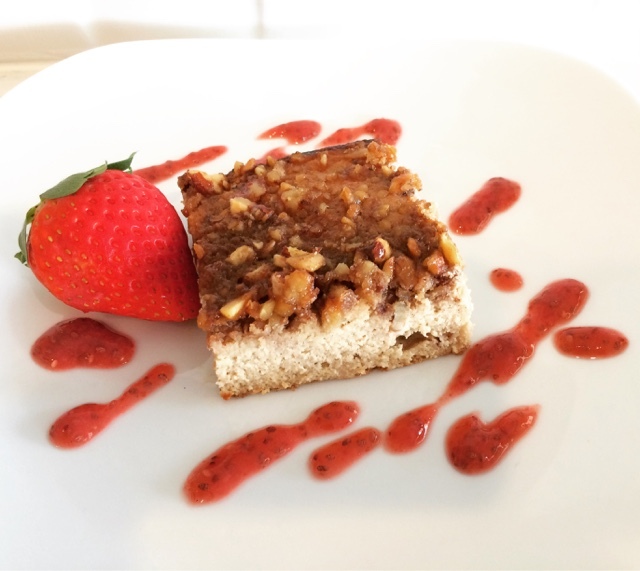 Paleo Pecan Strudel Cake Recipe: @bobsredmill Almond Flour 1 cup & 1/4 cup Coconut Flour, 2 Eggs, 1/2 cup Almond Milk, 1/2 cup Coconut Oil melted,1/4 Cup Agave, 1/4 cup @justins Maple Almond Butter, 1 TBSP Vanilla, 1/4 TSP Aluminum Free Baking Powder & Sea Salt = Mix & Pour into greased 8x8 Pan, Top with mixture of crushed Pecans, Coconut Palm Sugar & Almond Flour. Bake at 325 degrees about 15-20 minutes until good enough brown. 😝ENJOY!